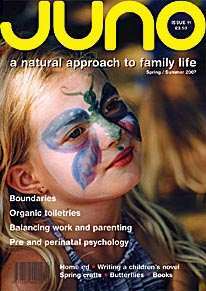 Juno Publishing Ltd, formed in 2010, publishes Juno Magazine, a parenting magazine with an ethos based on conscious parenting, sustainability, social justice, non-violence and a commitment to personal growth and spiritual awareness. Juno is named after and inspired by the Roman goddess of birth, fertility, marriage and female genius. Our aims are to acknowledge the valuable role of being a parent with all of its’ joys and challenges and to enrich family life and relationships by encouraging reflection, self-acceptance and peaceful parenting; building a sense of community and celebrating the roles of parenting and home making. Our broad editorial contains features, interviews, reviews, personal stories, crafts and celebrations. Contributions from our readers are central to the ethos of the magazine, and it is by sharing stories, ideas and information that we hope to empower you to be the parent you want to be.